Tri-Match is a matching game. You must match three or more objects by swapping any two adjacent objects. 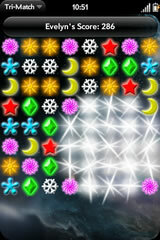 Match more than three objects to receive bonuses! Although the objects may seem small and hard to select, the object's touchable area is actually four times larger! This means that you don't have to be precise with your moves. Just touch the object you want to move and slide your finger in the direction of the object you want to swap with. Don't worry if you missed the object by a little bit. Tri-match is smart enough to deduce your intended move! Smooth animation and special effects add extra eye-candy for your enjoyment. Automatically resume play if you need to close the app. When you run the app later, your previous game will be loaded and ready for more! Tri-Match automatically gives you a hint if you can't find a move. 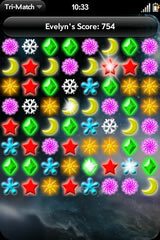 Create special explosive objects by matching 4 or more objects. When your game ends, there is a chance that these will explode to save you! Instant Replay! Did you just get an awesome combo? Did the action go by too fast to follow? Watch it again in slow motion! 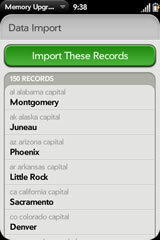 Pixi users can press 'R' on the keyboard to invoke this feature. Three game modes: Free Play, which lets you enjoy the game at your own pace, or Timed (3-minute) and Blitz (1-minute) modes, which give you a limited time to get as many points as you can! The game automatically pauses when the app is minimized. High scores are tracked. 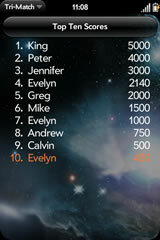 If someone else plays the game, they can change the player name so that their score is credited properly. Global high scores coming soon! 1.1 - Added instant replay feature and timed (3-minute) and blitz (1-minute) modes. This is a memory upgrade for YOU. 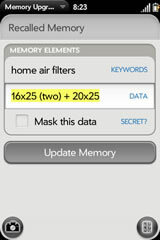 Your WebOS device has plenty of memory, so let your phone remember everything for you! 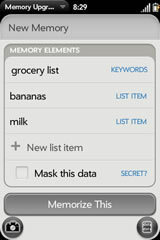 Provide the details of what you want to remember (keywords, text, lists, images), and instantly recall them later. When you want to recall a memory, just start typing in the search field, and matching results will automatically appear as you type. You can store individual pieces of information (e.g. what size are my air filters? 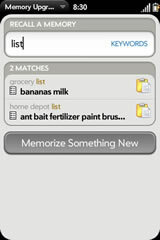 ), shopping lists, and even images. 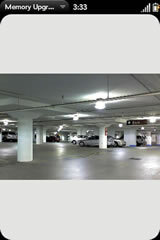 Want to make sure you don't forget where you parked? Take a picture! Assign it a keyword of "park", and you'll easily locate it later. MemoryUpgrade is fast! Your memories are stored in a database for fast performance and reliability. With MemoryUpgrade, you can have thousands of memories and recall any one of them in a split second! What if you want to use the same keywords for more than one thing? Not a problem! You can use the same keywords for as many memories as you like, and when you type in the keywords later, all of the matching memories will be displayed in a list. Just select the memory from the list to view/edit it, or press the icon to copy the data to the clipboard. What if you want to remember sensitive information, such as passwords? You can set the secret flag, which will mask the data in the results list with asterisks, yet you will still be able to copy the actual data to the clipboard by pressing the icon. This allows you to use your sensitive data without worrying about that person looking over your shoulder. Do you already have some data in a text file or spreadsheet? Do you want to enter your data more quickly using your computer? MemoryUpgrade can import tab-delimited text files. You can view the user's guide here. 1.1 (coming soon) - Added password protection for secret memories. 1.0.5 - Fixed bug when deleting all images for a memory. File import is more flexible when processing the secret column values (you can use 'true', 'yes', or '1'), and case is ignored. Comments, suggestions, or bug reports?